PROLINE VACTOR's telespection trucks provide a wide range of services for sewer drain pipelines and storm drainage systems from ensuring that new pipelines have been properly installed, to locating leaks and infiltration, damage or any other problems to existing pipeline systems. Our high tech cameras can track through pipes ranging in diameter from 8 inches to 102 inches. Skilled technicans operate the video equipment from above ground, controlling the movement of the mini-camera through the pipe. We videotape the images to provide customers with a record of our findings. Through this high-tech inspection process, we can detect cracks, leaks, and any other problems. Our trucks are also fully equipped to make any necessary repairs. Follow-up video can be made to provide before-and-after film of the pipeline condition. Municipalities are finding our inspection services an invaluable aid to ensuring their pipeline systems are not threatened by infiltration or any other form of damage. Proline Vactor also offers 5-year drainage recertification services to municipalities. Developers also find our services valuable in evaluating and cleaning new pipeline installations. 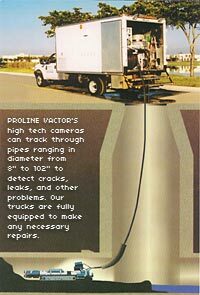 Call PROLINE VACTOR at (561) 340-1495.